I remember (fondly) that magic mushrooms were a craze in the ceramics dept. Aptly (perhaps) and commonly named; liberty caps (Psilocybe semilanceata). Someone even did sculptures of them (hello, Pete) for their final show. This was during the 1975-78 ceramic group stint. Other than that these years were a golden era of hard work and application (for some of us). Later many began to realise that what to do next was somewhat of a head-scratcher. Anyway, of our little clay and water tribe, Aonghus Gordon probably holds the time record for doing it for real (well done, man). John Potts (me) comes in second (I think), doing other retail things now since the mid-1990s; this was after running a small pottery workshop full-time for about 15 years. John Colbeck (during that period, Head of Ceramics at Bath Academy of Art) deserves a mention. Always the cool gentleman and, typically svelte in black, a superb instructor. But, we all know that already. Two events which I can remember after some 50 years are firstly the arrival of a Juke Box in the basement which seemed stacked with Buddy Holly records and certainly made coffee breaks more lively. Secondly in 1960 we played a football match against a local team and managed to draw 2-2 ~ this is memorable because it was virtually the only contact I can remember we had with the locals and was played in a great spirit. It is the only game I ever played with a crowd watching. Curious life can be, and always surprising. My oldest friend, Eddy worked at Copenacre and I was studying and being wild at BAA, not necessarily in that order. Now I live in Normandy, and HE lives in an apartment on the Beechfield site with his French girlfriend. I still dream often of the carefree days and just remembered last night an incident told me by Stewart Colderick, who lived in "The Grange", a huge mansion opposite the Methuen Arms and was a school friend.. In 1977'ish I suppose, Stewart was working at the Court at weekends and Noel Edmonds swans in with a Porsche, strides up to the front door and Stewart says "that will be one-fifty please". Edmonds replies "Don't you know who I am?" (rather clichéd but nevertheless true). Stewart replied, "Mr. Edmonds, that will be one-fifty for you." Mr.Showbusiness snorted and fumed and turned on his heels, stomped to his car and sped off. I have just remembered another incident from 1977 when Patrick (Steed) Macnee was in the Methuen visiting his elderly mother there. I shall leave that for another day. Imagine my surprise and delight at finding a picture of me at 19 with my group, group B of 1960! There we all are! Just like it was yesterday! Thank you Peter Tuck for posting it on this excellent web-site! My daughter asked me a while ago to write my autobiography and I have got to the part where I was a student at BAA Corsham. Looking for information on the internet, I came across this amazing site with its photos old and new of the town, Corsham Court, Beechfield and Monks Park and I was instantly transported back to the early 60's and my mostly miss-spent youth at BAA. I hardly remember anything at all of the classes I took. I was so hell bent on having a good time. I do remember, though, the kindness of Malcolm Hughes who took us for painting. He was especially gentle with me the time I got stage fright and ran from the room where I was trying to give a presentation to the group on Paul Cezanne. He quietly dried my eyes and sent me back in to finish the job. Which I did! I was mostly indifferent to the other tutors and was frankly scared to death of Rosemary Ellis with whom we had to spend a good deal of time because we were in her photography group. But she did take us on a couple of good field trips, to Malmesbury Cathedral to draw the sculptures on the doorway and to Cirencester to do brass rubbings. I wonder if other female students who were around in 1960/61 remember bunking off over the high wire fence around Monks Park to go to the Arts Ball, all dressed up in Shakespearian costume or going off to see Humphrey Lyttleton play at a jazz concert at some railway station. Many was the time I staggered home on Sunday through the fields in the early dawn and once, on falling asleep in the corner of a field, I woke with a start to find myself surrounded by curious cows who snorted steam in my face! I wish now I had put as much into my studies as I put into learning to play skittles and darts because I realise now what a privilege it was to have been part of this unique institution. Still, some of it must have stuck because after withdrawing from the course in April 62 (probably saving them the trouble of throwing me out!) I emigrated to Melbourne, Australia with my widowed mother and my two young siblings and set about taking up my studies in art again. I became an Art teacher after all! I met my husband Steve Craddock in 1965, a fellow teacher, and we married in 1966.We had one child a daughter in 1970. I taught for 30 odd years and now we are retired and live on the Victorian surf coast where I still paint, in between writing tasks. Sally Pinfield never forget the ice lolly at Ethelred House after the Bowie concert. David Jones 1972-75 a fine artist to be remembered. Well it was an ignominious departure, having spent most of my time at The Hole in the Wall Jazz Club in Bath, and finding a distinct lack of empathy, between myself and either of the Ellis family, but I have some very happy memories, and wish I had taken advantage of the opportunities Bath Academy offered. Still we live and learn. I probably made more money as a barrister. I still practice law from time to time, but I live in France now. As for art, I must be a philistine, because I still, can't for the life of me, see anything to recommend the paintings of Howard Hodgkin. I paint better stuff here in my glorious attic overlooking fields of cows in Payes de la Loire. I have very very fond memories of Diana Cooper, John Gridley, a lovely tall chap called Mike who was going out with a girl with no chin. I hope all of you are flourishing and happy, and if you're ever in France, telephone 0033 24305 4168. Please excuse me for being late for class, I'm a bit out of touch: I've been away from England for forty five years or so. 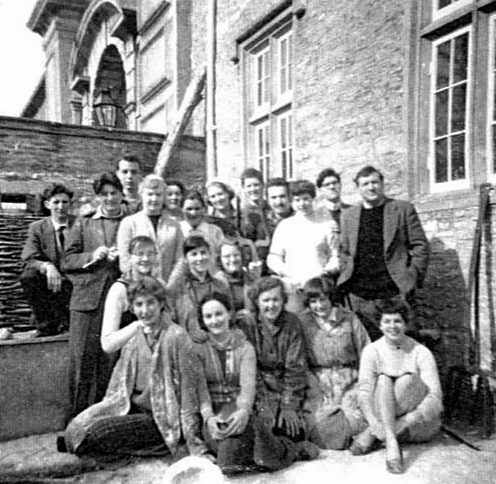 So, I forgot to mention last time that another student, Christine Manning, was at Corsham from 1957-1959 (she is shown in the Music Group photo - next to John Hoskin). We married in 1960 when we were both at Corsham. (I proudly pushed my first of six around at my last Open Day in 1961.) We bought a damp old cottage in Atworth for two hundred quid, just down the road from from Stephen Russ' place. Opposite his old cottage lived a Corsham Life model, Marg, I think. I always thought that Stephen was the fittest member of the permanent staff, apart from his bike rides with us, he rode it several miles a day to get to Corsham and back. They broke the mould after they made him! We used to visit Stephen Russ and Co. He seemed to have too many children. Before we left the area he built a fine studio in his back garden where he was able to escape for a bit. What a fine teacher, artist, and person Stephen was. Wonderful cycle tours with us for miles. He clearly enjoyed it as much as we did. At one evening class in the Court (Experimental Drawing), he started us off drawing tangents around our hands. He then produced a lino-cut from his pocket, and worked on it for the rest of the class. 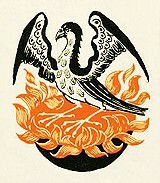 It turned out to be the Phoenix design for Penguin books (D.H.Lawrence editions). More elusive impressions: the always cool, ghostly white, plaster room below the Gatehouse. And at the end of each year pick-axing plaster six inches deep from the floor. Other times: racing to beat John Hoskin to the one and only welder at the start of class. I usually lost! Another gem was James Tower. James tho'a tower of artistic strength, was a bit absent-minded. I lived opposite his house for a while. It was not uncommon to see his little car parked in the middle of the street (Church Street? ), the doors open and the engine running for long periods of time. Back to the original story; Christine and I parted after seven years. She died in South Africa in 1999. I write this from her daughter's house in Australia, 2004. I shared a room at Beechfield House with Tony Jackson. I had studied the piano and had sung in the choir at school and in St David's Pantasaph, so I was put in the music group. After class we'd mosey down to the Packhorse for a few before supper at the Court. Invariably we'd end up back in the Packhorse, Tony on the piano and we'd sing all manner of songs. Tony taught me rhythm guitar. We got a grant from the Academy Club (much to the dislike of Clifford Ellis) to buy a second electric guitar and amp. Ray Pitt had a set of drums. Chris appeared with a bass and we played at parties and in the local pubs. We changed our names at every pub venue. We appeared as the Tony Jackson Five with Paul Deacon on raucous vocals: then as Ray Pitt and the Assaulters plus other names I can't remember now. Tony played lead guitar and piano as well as Lennon-type vocals. I'd sing McCartney-type descant stuff like" Kansas City" and "I'm down". At the end of the course(1966) I asked Tony if he'd like to continue with the band as I was up for it. He said "no", he was going to get a proper job. Tony you were a kool room mate. You inspired me to play guitar and I'm still with it. Big up t'ya dude! Does anyone remember the Band, we used to play at Monk's Park, other venues when we could, Cris Garrett guitar, Mike O'Donnell drums, Jackson on Piano, Deackon? There were some extremely good moments and in some ways very cutting edge for it's time. Happy memories of a very well spent youth. 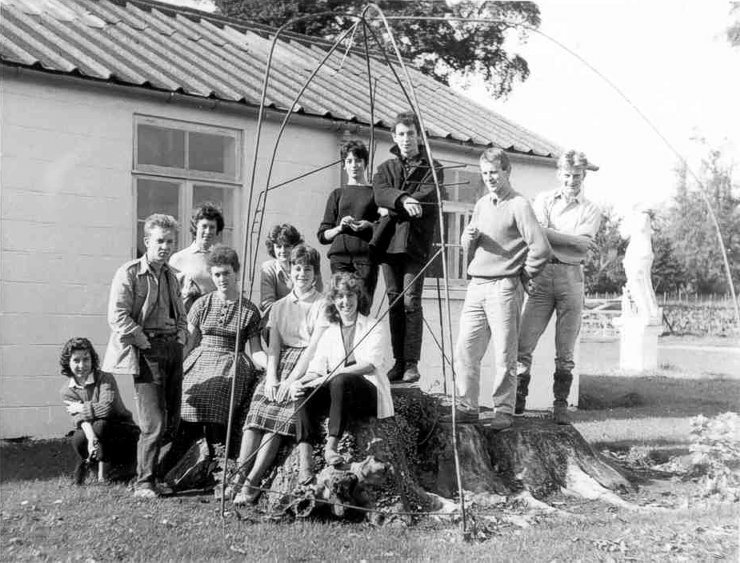 I went to visit Corsham and the sculpture school some years ago, after it had closed down. It was one of those misty autumn mornings, I found myself and my children walking up onto a huge mound of rubble. We were standing on what had been the sculpture school. It was a surreal experience standing there remembering all that had gone on underneath us and was now about to be turned into exec. homes. Somehow if felt profound to be on top of that rubble, I couldn't really put words to the feeling or the significance it had but it is a strong memory.. Does anybody remember Mark Eason (aka Dr. Death) putting a pigshead into his then girlfriends bed as a surprise for her? I don't believe she remained his girlfriend much after this. Incidentally I understand Mark now works in the USA - something to do with film lighting or some such. Herbie can correct me on this if he reads this. I certainly remember the rat-induced eviction Tim. I seem to remember you came back from the Easter holidays to find all your possessions in packed boxes in the hallway. I also seem to remember that you had trouble finding alternative accommodation. This was not helped by the fact the Herbie promised to make your life "a living-hell" if you were relocated into his room. I have numerous similar anecdotes which one day I will recount here. Hi, yes folks it's me, Tim Beck. Does anyone remember when I shared a room with Paul Cousins in Church Street in the first year? Well we had to move out because the rats moved in. Does anyone remember eating the laxative cake we planted in the fridge in 4 Church Street’s kitchen to deter the thieving bastards who visited to watch telly? If so, nyah, nyah, nyah! This page was requested by David Bullock - an Anecdotes of Corsham section - for you to send in whatever memories you wish to impart on us. I don't expect to read a novel here, but if you must, then get typing! More likely it's going be 'very' short stories! To write your story, access the current password protected Guestbook and click on the anecdotes page link. 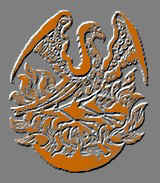 Copyright © 2002, http://www.baacorsham.co.uk. All rights reserved. Last posting: September 05, 2015.